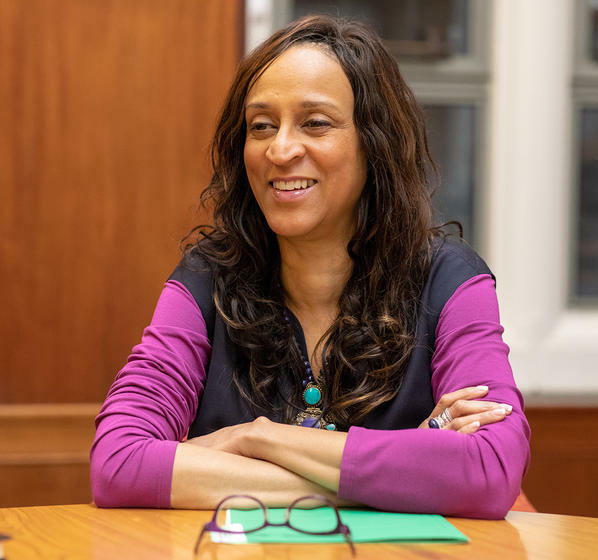 Kimberly Goff-Crews, Yale’s secretary and vice president for Student Life, grew up in Los Angeles and did not leave the city until she traveled to Yale University to go to college. Kim earned a B.A. from Yale College (“Berkeley! !”) and a J.D. from Yale Law School before heading to New York City to practice law. In 1992, she came back to Yale to run the Afro-American Cultural Center and serve as an assistant dean in Yale College, embarking on a career in higher education that would take her to leadership positions at Lesley University, Wellesley College, and the University of Chicago before she returned to Yale in 2012 to take on her current position. The book I’m reading now is about robotics and education—“Robot-Proof: Higher Education in the Age of Artificial Intelligence” by Joseph Aoun, the president of Northeastern. I’m completely fascinated by how a liberal arts education will be even more needed in this new age of artificial intelligence. I’m also very into podcasts lately —everything from Krista Tippett “On Being” to Oprah’s Master Class interviews. What do you think is the best advice a manager can receive? What musical artist are you listening to at the moment? My taste is eclectic. I still like a lot of old R&B. I happen to love Chaka Khan, Luther Vandross, and I recently saw a great documentary on Quincy Jones, who is an amazing musician. But I also like country music, which I was first introduced to when I worked for a high school principal who told me that listening to his country music station was a job requirement. I don’t think he could get away with that now! But I learned to enjoy it. I tend to like women songwriters, like the Dixie Chicks. I’ve recently figured out that it’s not so much the genre for me as it is the storytelling. Alicia Keyes does a good job with this; she is very powerful. I like good storytelling because it’s like poetry to get an idea across. When faced with a challenge on the job, what do you do first? I like to get facts from a variety of people. The question for me is not just ‘what is the problem’?, but ‘is the problem a symptom of something else?’ Getting to the underlying issue requires deep listening, which requires focus and that you be centered and present in the moment. I practice meditation regularly, which helps with this. It teaches me to breathe deep, and then make a conscious effort to be present in all those conversations. I‘m calmer in a crisis, I’ve realized, and it allows me to do what I like to do, which is to listen to what people are explaining and then what they’re feeling. My family and friends. I love my family and friends. I’m also grateful for a sense of purpose. And of course, chocolate. What would be your ultimate vacation destination? Oh, I have a lot of ultimates. But, one would be a six month trip—half in Morocco hanging out in the souks, and the other half plopping myself down in Italy and just relaxing. I like a vacation where you do nothing, and also a vacation where you are active, and around a lot of beauty and interesting people. One summer I did a Blues tour in Mississippi and in another I went on a photo safari in Zimbabwe. Last summer I did a walking and hiking vacation in Ireland, and now I would really like to go to Spain to walk and hike the Camino de Santiago. If you could solve one human problem in today’s world, what would it be? I think it would probably be solving the need for people to feel valued in the world…anywhere. What New Haven restaurant would you recommend to a new employee? I love Zinc, but I also like to point people to Soul de Cuba. It’s great food and there’s so much of it, and the space is intimate and funky. What is a favorite memory from childhood? I have many different memories, but one that stands out the most is driving down Pasadena freeway with my grandmother, mother and sisters and singing silly songs at the top of our lungs. It was fun with all the girls in the car—a road trip with two outrageous women and ready-to-play pre-teens. We like to have fun in our family! Tell me about the first time you did one of the following—made a mistake on the job; reached an important goal; or realized what you wanted to be when you grew up. I think one of the most important moments was when I first realized not what I wanted to do, but what I wanted to create, and I understood the difference. As a practicing attorney in New York City, I had a great skill set, but what was the real purpose in my life? My answer was to be the best I could be as a person, and then create an environment for others to do the same. I realized that this is what I enjoyed doing and that’s why I think I’m here; all the other choices were easy. Taking a moment after all my schooling to ask who am I, what do I believe in, and what do I want to contribute?—that eye-opening moment was a first.